Breathe life into your custom greeting cards by using your favorite photos as part of your card layout! Not only will your best memories add color and personality to the look of your cards but they’re also a great way of sharing your pictures with friends and family for any occasion. From wedding cards to personalized stationery, our double sided greeting cards are ideal for any occasion throughout the year! With graduation around the corner, it’s time to start thinking about announcements and invitations. Get yours started by gathering your senior’s favorite pictures. Whether it’s their best senior portrait or random snapshots from their last year in high school, you can upload them to MailPix and easily create personalized graduation cards that illuminate your grad’s best moments from school years past. 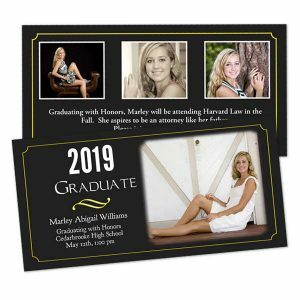 Photo graduation cards make the perfect announcements and invitations to your party afterwards! Create a one-of-a-kind Mother’s Day card with photos to make Mom feel special! Our card stock photo cards can be printed front and back with pictures, text, or even your own artwork. Create a collage on the front and then add a personal message on the back to create the ultimate Mother’s Day greeting. We also offer unique, personalized Mother’s Day gifts! Create your gift, order your card, and make Mom smile on her special day with our convenient, one-stop Mother’s Day shop! In a matter of minutes, you can create Fathers Day greeting cards that feature a collage of Dad’s best pictures! Our double sided photos are perfect for any greeting since your can print them front and back with both pictures and text. In addition, you can choose a background template for each side that compliments your selected photos. At MailPix, you can also make photo gifts for Dad! Create a Fathers Day photo book, a personalized desktop plaque, or a custom printed necktie! For an unforgettable Father’s Day, look no further than MailPix! With our user-friendly project editor, you can create the perfect set of stationery cards that are full of character and charm. Simply find a beloved picture, let your creativity flow and design your own greetings with ease. First, gather your favorite photos and upload them to MailPix. Once you have uploaded your photos, choose between our 5×7 and 4×8 card sizes. Then, select the perfect template that is perfect for any card occasion. After opening your card in the builder, simply drop your photos onto your layout. Additionally, you can use our text feature to add a personalized message. Once your card layout is complete, just add your cards to the cart, select your quantity and finally, place your order. After receiving your order in the mail, simply add your own handwritten message and send them using our complimentary envelopes. They’re sure to be well received no matter the occasion. Getting ready to throw a party? Maybe you are considering a fun invitation to send to your guest list. Why not incorporate your own photos into your card design and kick off your celebration in style. Maybe you are throwing a birthday party for your son or daughter. Create a fun photo birthday invitation using their favorite picture. Use one of our many templates and your own text to create a birthday invitation that’s perfect for your party. Did you receive a special gift from your favorite aunt for your birthday? Maybe your best friend helped you move into your new apartment and you want to thank her for her invaluable assistance. To show your gratitude, why not create a set of customized thank you cards. Build your thank you notes using one of our many stylish templates and add your favorite photo to your layout. Our double sided cards are perfect for not only sharing a beloved picture with your loved ones but also your own handwritten note on the back to show just how much you appreciate them. If you’ve just experienced a major development in your life, you might be thinking of sending out custom announcements to all your friends and family. Let MailPix help you create the perfect announcement using your best digital images and customized templates. We offer a variety of styles that are guaranteed to please. Even better, our double sided save the date postcards are great idea whether you’re planning a wedding, baby shower, or a house party for all your friends and family. Maybe you’ve just moved into a new place and you want to share your new address with your friends and family. Instead of sending an email or a group text, why not celebrate the occasion formally and design your own moving announcements. Find the perfect photo of you and your family in your new home to display on your moving announcement cards and include your new address to update your loved ones. You can even mention your upcoming housewarming party. Choose from multiple elegant templates that not only accent your photo but also compliment your personality and style. Did you just add a new member to your family? There is no occasion more joyous than the birth of your baby. Let your loved know all about your new bundle of joy and create your own photo baby announcements. 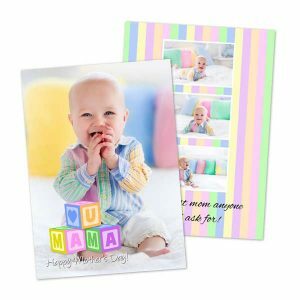 Our double sided cards are perfect for showing off your newborn’s very first photo on the front and sharing all the adorable details and a heartwarming message on the back. We offer a multitude of photo layouts and backgrounds so you can customize the perfect baby announcement card. Perhaps your little bundle of joy is all grown up and is getting ready to finish their senior year of high school. Celebrate their hard earned achievement by creating the ultimate graduation announcement. Show off their best school year photos and include details about the graduation day ceremony to keep your loved ones in the loop. Our stationery cards make a great graduation party invitation too. Just upload your son or daughter’s favorite senior year photo and let your creativity flow. Whether you’re looking to create an elegant invitation, send a thoughtful greeting or design your own stylish announcements, we offer a variety of templates for all occasions. Create a stunning double sided card stock card and include a favorite photo as part of your own customized layout. Our cards can be personalized with your own text and are ready to send once you receive them in the mail. Just upload your photos to MailPix and get creative! Design your own stationery cards with ease and send a little love to your family and friends, any time of year!